This "1860" photo shows Grab Corners, now Campau Square, before the "S curve" leading from Monroe Ave. to Canal St. was straightened. The three-story building with the large "Clothing" sign, the one to the right, and the Auction building were all demolished in 1873 to allow for a better meeting of Monroe, Pearl, and Canal Streets. Sweets Hotel, at the corner of Canal and Pearl is the large building seen behind the Auction House and the Clothing Store. 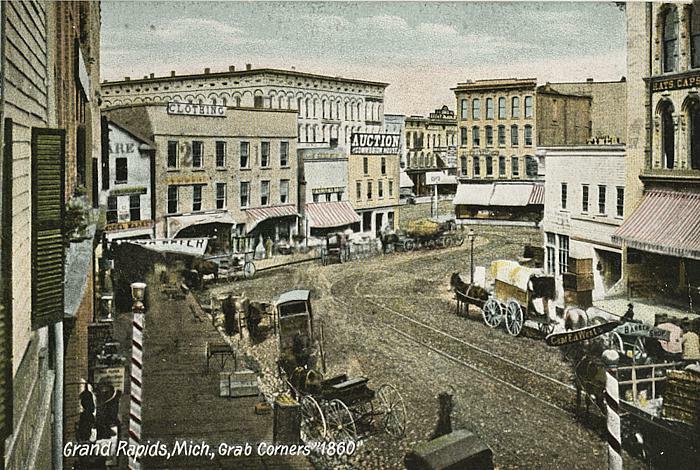 A small portion of the Rathbun Hotel can be seen at the far left. The sign on the striped barber pole reads, "Capt. Ed West's Barber Shop". Notice the board sidewalk next to the street where horse drawn wagons are parked. The streetcar tracks visible in the street indicate that the photograph was taken after 1865. Title from document. The postcard, labeled "1860", was made around the turn of the century from an old photograph, and the actual date was probably unknown. A good comparison of the area can be made by looking at the photo, taken in 1873, at the right under Related Items. Sweet's Hotel on Canal St.